LONDON KY—On Wednesday, March 8th London Police Sgt. Randy Medlock pulled over a driver on the Hal Rogers Parkway for not wearing a seatbelt and discovered methamphetamine. Sgt. 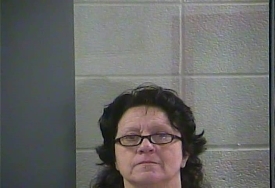 Medlock conducted a traffic stop on Debra L. Sizemore, 57, of Pittsburg, Ky., for not wearing her seatbelt. Police noticed Sizemore acting fidgety and overly anxious in the vehicle. Ofc. Jacob Bor mann assisted at the scene and Police were given consent to search Sizemore’s vehicle. A clear plastic bag containing a white crystal substance was located in her purse and Sizemore stated that she had used meth the night before. She was manifestly under the influence of a controlled substance and was arrested by Ofc. Bormann. Sizemore was charged with public intoxication of a controlled substance excluding alcohol and first-degree possession of a controlled substance (methamphetamine). She was lodged in the Laurel County Detention Center.